The perfect portable reloading press kit. Begin reloading at once. No wasted time mounting to a work bench. Pack it all in the box when finished. Great for apartment dwellers or loading at the range. 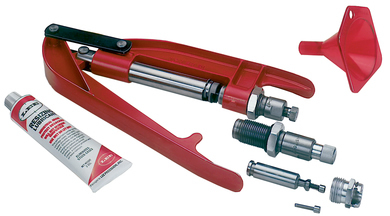 Includes Breech Lock Hand Press, Ram Prime, Powder Funnel, Case Lube and one Breech Lock Quick Change Bushing. Order a set of dies to complete. The hand press kit includes hand press, ram prime, powder funnel and case sizing lube.